Mark your calendar! 26 Jan!! The phone will be available on 26th January for S$1,098 in Platinum Gray, Moroccan Blue, and Carmine Red. 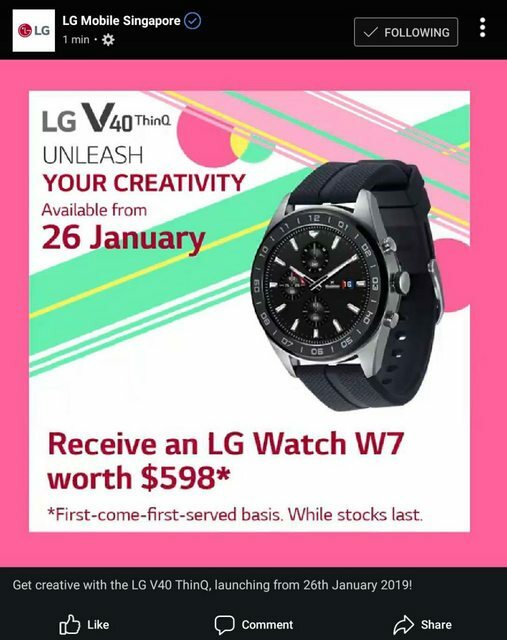 Customers who purchase the phone before 22nd February will also receive a free LG G Watch W7 smartwatch (worth S$598). but more importantly, launch date is 1 day after the start of MWC, wonder how many people will go from wanting the V40 to wanting to wait for G8 instead, assuming the original plan to launch the G8 at MWC still holds. PS: that rumoured phone turns out is not LG G8. Last edited by gws898; 19-01-2019 at 01:15 AM.. Saw the real demo set at M1. wear OS...seem like getting lousier and lousier...not sure why LG still charging 598 for a watch? mark up the value to make the deal look better? Saw qoo10 got sell. Able to use coupons. Should i change from Samsung note 9 to this LG ? LG like liao gas . lol but got 5 camera leh. 5 vs 1 still lose...so many cam for what? $1098, only Platinum Gray color plus NOT FREE LG Watch W7!